Broth is a savory liquid made of water in which bones, meat, fish, or vegetables have been simmered. It can be eaten alone, but it is most commonly used to prepare other dishes, such as soups, gravies, and sauces. Commercially prepared liquid broths are available, typically for chicken broth, beef broth, fish broth, and vegetable broth. In North America, dehydrated meat stock in the form of tablets is called a bouillon cube. Industrially produced bouillon cubes were commercialized under the brand name Maggi in 1908, and by Oxo in 1910. Using commercially prepared broths saves home and professional cooks time in the kitchen. By 2013, broth labeled as "bone broth" became popularized as a health food trend or fad in certain parts of the United States. In the late 18th century, Benjamin Thompson, (1753–1814) an American-born physicist in service to the Elector of Bavaria, invented and mass-produced a fully nutritious, solidified stock of bones, inexpensive meat by-products and other ingredients, using it to feed the Elector's army. His invention was the precursor of the bouillon cube. Broth has been made for many years using the animal bones which, traditionally, are boiled in a cooking pot for long periods to extract the flavor and nutrients. The bones may or may not have meat still on them. Egg whites may be added during simmering when it is necessary to clarify (i.e., purify, or refine a broth for a cleaner presentation). The egg whites will coagulate, trapping sediment and turbidity into an easily strained mass. Not allowing the original preparation to boil will increase the clarity. Roasted bones will add a rich flavor to the broth but also a dark color. 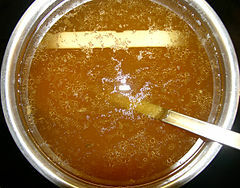 A clarified broth eaten as a soup is often called a consommé. In East Asia (particularly Japan), a form of kelp called kombu is often used as the basis for broths (called dashi in Japanese). In the Maldives the tuna broth known as garudiya is a basic food item, but it is not eaten as a soup in the general sense of the term. By 2013, "bone broth" had become a popular health food trend, due to the resurgence in popularity of dietary fat over sugar, and interest in "functional foods" to which "culinary medicinals" such as turmeric and ginger could be added. Bone broth bars, bone broth home delivery services, and bone broth carts and freezer packs grew in popularity in the United States. The fad was heightened by the 2014 book Nourishing Broth, in which authors Sally Fallon Morell and Kaayla T. Daniel state that the broth's nutrient density has a variety of health effects: boosting the immune system; improving joints, skin and hair due to collagen content; and promoting healthy teeth and bones due to calcium, magnesium and phosphorus levels. However, there is no scientific evidence to support many of the claims made for bone broth. For example, while bone broths do contain collagen, there is no evidence that consuming bone broths improves joint pain or improve skin, because dietary collagen is broken down into amino acids, which become building blocks for body tissues, and is not transported directly to joints or skin in the form in which it is ingested. In addition, the fact that the broth is derived from bone does not mean that therefore it will build bone or prevent osteoporosis, as the bones release very little calcium into the broth when prepared. There is little evidence that the gelatin that they contain functions as a digestive aid. A few small studies have found some possible benefit for chicken broth, such as the clearing of nasal passages. Chicken soup may also reduce inflammation; however, this effect has not been confirmed in controlled studies of adults. ^ Rombauer, Irma S.; Marion Rombauer Becker; Ethan Becker (1997). Joy of Cooking. 1230 Avenue of the Americas, New York, NY 10020: Scribner. p. 42. ISBN 0-684-81870-1. ^ Morell, Sally. "Broth is Beautiful". Retrieved 23 October 2014. ^ Denn, Rebekah (2017-08-21). "Magic or mythic? Bone broth is at the center of a brewing cultural divide". The Washington Post. ISSN 0190-8286. Retrieved 2017-08-31. ^ Heid, Markham (January 6, 2016). "Science Can't Explain Why Everyone is Drinking Bone Broth". Time. ^ a b Blaszyk, Amy (February 10, 2015). "Taking Stock Of Bone Broth: Sorry, No Cure-All Here". NPR. ^ Simpson, Steph (2016-11-14). "What's All the Hype About Bone Broth?". Reader's Digest. ^ "What's the scoop on bone soup?". Harvard Health Publishing. Harvard Medical School. September 2015. Look up broth in Wiktionary, the free dictionary. 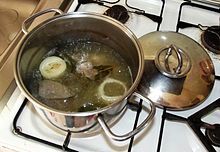 Wikimedia Commons has media related to Broths.